One legend claims that the discovery of tea occurred in 2737 BC by the Emperor of China. For several hundred years, people drank tea because of its herbal medicinal qualities. By the time of the Western Zhou Dynasty, tea was used as a religious offering. During the Han Dynasty (202 BC – 220 AD), tea plants were quite limited and only royalty and the rich drank tea not only for their health but also for the taste. As more tea plants were discovered during the Tang Dynasty (618 – 907), tea drinking became more common among lower classes and the Chinese government supported planting of tea plants and even the building of tea shops so everyone could enjoy tea. Also during the Tang Dynasty, tea spread to Japan by Japanese priests studying in China. Similar to the Chinese adoption of tea, tea was first consumed by priests and the rich for its medicinal properties. Tea is often associated with Zen Buddhism in Japan because priests drank tea to stay awake and meditate. Soon, the Buddhists developed the Japanese Tea Ceremonyfor sharing tea in a sacred, spiritual manner. The Emperor of Japan enjoyed tea very much and imported tea seeds from China to be planted in Japan, making tea available to more people. Tea finally arrived in England during the 17th century when King Charles II married a princess from Portugal, Catherine of Braganza. The Queen made tea the drink of royalty and soon tea became a popular import to Britain via the East India Company. Afternoontea or tea parties became a common way for aristocratic society to drink tea. Though tea was regularly imported to Britain, the taxes were so high that smugglers would get and sell tea illegally for those that could not afford it. In attempts to turn profits during the tea smuggling period, the East India Company began exporting the tea to America. The American tea was also taxed heavily and contributed to the cause of the Boston Tea Party. There are many ways to serve and enjoy tea. Asia, where tea was first discovered, has its own unique traditions of serving tea. In China, tea serving customs are used frequently for occasions like family gatherings, weddings, and for simply showing respect or offering apologies. Different equipment and tools may be used in Chinese tea service. The essential tea service equipment includes a tea pot for brewing loose tea leaves, a tool for removing the tea leaves, and a cup for drinking the prepared tea. First, Yixing teapots are very common for serving tea. Over time, this type of clay teapot absorbs the flavors and essence of the teas are brewed inside it. This seasoning effect enhances the taste of the tea, cup after cup. In Japan, cast iron teapots are typically used for serving tea and also will acquire a seasoned coating after prolonged use. Additionally, porcelain teapots can be used for serving tea. Tea preparation in each of these teapots is very similar and mainly differs by the type of tea brewed; read more about how to brew tea. The tea leaves should be removed from the teapot before serving tea to prevent others from drinking the leaves and because most teas should not be steeped longer than their recommended steep time to avoid tasting bitter. A hand-held strainer can be used to catch tea leaves as tea is poured from the teapot. And many teapots contain a built-in strainer for easy removal of the tea leaves. Finally, serving tea in a tea cup or mug is one of the best ways to enjoy freshly made tea. Glass tea cups can enhance a tea service by allowing a view of the beautiful color of the tea. Cast iron teacups complement the taste of the tea from the teapot of the same material. Artistically designed ceramic teacups and porcelain tea mugs are also options for serving tea and show a unique style. English and British traditions have certainly elaborated on the essentials used in tea service. 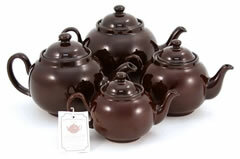 At a typical English full tea service or tea party, you may find a fanciful tea set for serving tea. A full tea set typically includes a porcelain or bone china tea pot, tea cups with saucers, a sugar bowl, creamer, tea kettle, waste bowl, and tray. The early days of tea are wrapped in legend and myth. In about 2737 BC it is said that the Chinese Emperor Shen Nung, scholar and herbalist, was sitting one day beneath a tree while his servant boiled some drinking water. A leaf from the tree dropped into the water and Shen Nung decided to try the brew. The tree was a wild tea tree, Camellia sinesis. By the time of the Tang Dynasty (618 - 906 BC), tea was China's national drink. The modern term tea derives from the early word in different Chinese dialects -Tchai, Cha, Tay -used both to describe the beverage and the leaf. he Portuguese and the Dutch were the first traders transporting regular shipments of the new herb to the ports of France, Holland and the Baltic coast. In 1610 small amounts probably reached England but there is no record of tea being sold here until 1667 when the merchant Thomas Garway offered it in dry and liquid form at his coffee house in Exchange Alley in the City of London. The early coffee houses were favourite meeting places for gentlemen from all walks of life, but ladies drank their tea in the privacy of the home. Samuel Pepys recorded in his diary for 28th June 1667 that he "arrived home and found my wife making a tea, a drink Mr. Pelling, the potticary tells her is good for her cold and defluxions." Through the 17th century the price of a pound of tea was extremely high, partly because it was still a fairly rare commodity but mainly because Charles II imposed on it and other beverages, a very high tax. The high cost led to smuggling, adulteration of the leaves and a thriving black market which did not end until the tax was reduced in 1784. Gradually, more and more tea was shipped into England and the first tea auction was held in London in the early 1700's. By 1790 Britain had established herself as the center of the world tea trade. By the middle of the 18th century, tea had replaced ale and gin as the drink of the masses and had become Britain's most popular beverage. It was taken at almost any time of the day or evening, the upper classes enjoying the habit of serving elegant bowls of tea after evening dinner. At the beginning of the 19th century, the Duchess of Bedford is said to have been the first to serve afternoon tea with some light refreshment and thus started a trend that is still an integral feature of British life. Tea is an evergreen plant of the Camellia family and is known as Camellia sinensis. It was first discovered 5,000 years ago in China, hence 'sinensis', but in reality, it is indigenous to both China and India. If left to grow wild, tea grows as a tree and can reach a height of some 30 feet. Today, under cultivation, tea is kept to bush size for easy plucking. Tea varies in characteristics and flavour according to the type of soil, the altitude and the climactic conditions of the area in which it grows. Other contributory factors are the method by which it is processed and, of course, blending together teas from different areas. There are more than 1500 teas to choose from and they grow in more than 31 countries. Production Methods When tea people talk of "making tea", they are not talking of brewing up, but of manufacturing or processing the plucked tea leaves. There are three types of tea -green, oolong and black. Black tea has the largest percentage of the tea market and there are five stages in its making: Withering -the plucked leaf is spread out on trays and left to wither. Rolling or Cut, Tear and Curl -the withered leaf is broken so that the natural juices or enzymes are released. Orthodox production uses the original type of machine that rolls the leaves to break the veins. CTC (Cut, Tear and Curl), unorthodox production uses more modern machines to breakup the leaf and release the juices or enzymes. Fermentation -the broken leaf is spread on trays or put in troughs. On contact with air, the leaf juices oxidize. In the tea trade this is known as fermentation. The leaf is turned from time to time until each tray or trough is full of rusty brown broken leaves. Drying (sometimes known as firing) -the oxidized or fermented leaf is fed through a warm air chamber where the moisture is extracted and the tea emerges at the other end where the dark warm brown tea, called black tea, is fed into chests. Sorting -the black tea is fed into a machine with a series of varying sized sieves and outlets. This sorts the 'grades' or different sized leaf particles into chests or sacks before the tea is weighed and made ready for its onward journey to auctions, traders or packers. Oolong tea undergoes the same process as black tea but the fermentation time is halved. For black tea approximately 3 1/2 to 4 1/2 hours are allowed. For Oolong tea this is restricted to 1 1/2 to 2 1/2 hours. The plucked leaf is allowed to wither. It is then steamed and rolled into a small ball or pellet and dried. The result is a small grey-green pellet of tea. After processing, black tea is sorted by the size of the leaf articles into different grades. There are two main categories -leaf grade and broken grade. Each grade is sub-divided into further categories. Fannings and 'dust' grades are the smallest particles. Two tea names, which often cause confusion, are Orange Pekoe and Broken Orange Pekoe. The names have nothing to do with orange flavour but denote quality and leaf particle size. Orange Pekoe is a whole leaf grade of tea with plenty of tip and bud that gives the dry black tea an attractive appearance with orange flecks. Broken Orange Pekoe has smaller leaf particles than Orange Pekoe.